When I saw this book, I was immediately drawn by the simple cover illustration that conveys a large bear’s utter melancholy. I immediately ordered it for my Children’s Storybook Collection at my library. 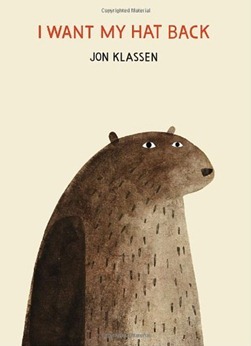 Jon Klassen, the author and illustrator, does a really fantastic job in this story with a twist. Like “Tadpole’s Promise” by Jeanne Willis, there is a wry ending that might not be for everyone, but possessing an off-kilter sense of humor, I loved both books. Bear has lost his hat. He really, really wants it back. Morose and oversized, he wanders from page to page, asking his woodland compatriots. The text is so minimal that you can’t help but draw your eyes back to the ever-despondent (but ever-so-polite) bear again and again. Repeatedly, bear is informed that his hat has not been seen, but wait! Look again! There’s a wily traitor in his midst. Who could it be? It is only when bear collapses onto the ground that he receives the right questions from Deer, and he is able to reunite with his (adorable) red pointy hat. This entry was posted in Books and tagged author-illustrator, bears, Canadian authors, Candlewick press, children's fiction, humor, Jon Klassen, Junior Library Guild selection, picture books, wry by S.D. McPhail. Bookmark the permalink.